The EM1365-LD OEM scan engine, armed with linear imager,is suitable to be integrated into various OEM devices including kiosks, ticket validators and PDAs. The EM1365-LD’s core technology UIMG isindependently developed by Newland, comprising optical system, digitizer,decoder, image processor and embedded system. The device demonstrates an unprecedented decoding capability on all mainstream 1D symbologies. The EM1365-LD supports EAN-13, EAN-8, UPC-A, UPC-E, ISSN, ISBN, Codabar,Code 128, Code 93, ITF-6, ITF-14, Interleaved 2 of 5, Industrial 2 of 5, Standard2 of 5, Matrix 2 of 5, GS1 Databar, Code 39, Code 11, MSI-Plessey, Plessey. 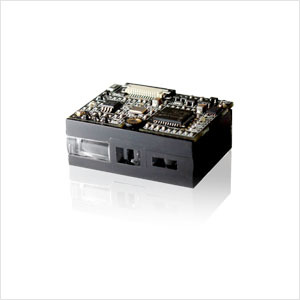 Two-In-One Design: Seamless integration of imager and decoder board makesthe scan engine small, lightweight and easy for integration. Superior performance: The EM1365-LD delivers fast and accurate reading of 1D barcodes. Low power consumption: The scan engine providesan optimal solution for battery-operated equipments and mobile devices. Easy to use: Simple parameter configuration. Symbologies EAN-13, EAN-8, UPC-A, UPC-E, ISSN, ISBN, Codabar, Code 128, Code 93, ITF-6, ITF-14, Interleaved 2 of 5, Industrial 2 of 5, Standard 2 of 5, Matrix 2 of 5, GS1 Databar, Code 39, Code 11, MSI-Plessey, Plessey. NLS-EVK Software development board, equipped with a trigger button, beeper and RS-232 & USB interfaces. Cable RS-232 Cable Used to connect the NLS-EVK to a host device; equipped with a power connector. USB Cable Used to connect the NLS-EVK3000 to a host device. Power Adapter DC5V power adapter, used to provide power for the NLS-EVK. *Test conditions: T=23℃; Illumination=300lux; sample barcodes made by Newland. 1D: Code 128; 5 Bytes; Resolution=10mil; PCS=0.8.